Just like the majority of over-the-counter multivitamin supplements, Centrum's products are typically safe for the average healthy person. But if you have known intolerances or allergies, Centrum may not be a good fit for you. These multivitamin supplements contain ingredients that can cause uncomfortable -- and sometimes dangerous -- side effects. Centrum multivitamins aren't made of any gluten-containing ingredients like wheat flour. However, the manufacturer explains that because certain ingredients can become contaminated with gluten during processing or shipping, the company doesn't guarantee that the final product is 100 percent gluten-free. Cross-contamination occurs when ingredients that are naturally gluten-free are exposed to gluten. For instance, if the ingredients used in Centrum came from a plant that also processes wheat, there is potential for gluten to contaminate the normally gluten-free ingredients before they get shipped out. If you know you're intolerant of gluten or have been diagnosed with celiac disease, Centrum multivitamins might not be suitable for you. Otherwise, you could have loose stools, flatulence and severe stomach cramps associated with gluten intolerance. Some Centrum multivitamin products, like the Flavor Burst Chews, contain the allergen soy. Generally soy allergies cause mild reactions, including vomiting, diarrhea, stomach pain, sneezing, hives and red watery eyes. If you're severely allergic to soy, though, your mouth and throat may start swelling, making breathing difficult. Since these symptoms are likely signs of anaphylaxis, you'll need to get to the emergency room. Being lactose-intolerant simply means that your body can't handle lactose -- sugar from milk -- very well. For some reason, you don't have adequate amounts of the enzymes needed to break lactose down. The majority of Centrum multivitamins are lactose-free. However, chewable tablet multivitamins do contain lactose. So if you're one who normally has to avoid milk, cheese and ice cream, you'll need to skip chewable varieties of Centrum multivitamins. Otherwise, you could become gassy or have diarrhea after taking your supplement. If you're generally healthy and free of any chronic conditions, you shouldn't have any issues taking Centrum multivitamins. The supplement has the potential to interact with prescription drugs or other supplements, although this is uncommon. Before starting a new supplement regimen, go over all of the medications with your doctor, even if they're over-the-counter ones. If you're pregnant or breast-feeding, check with your physician first. 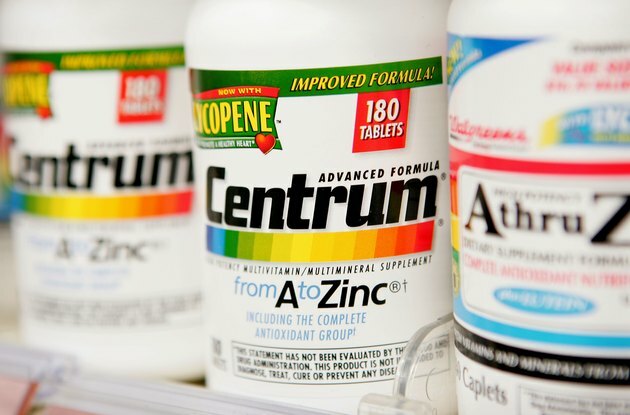 Centrum multivitamins should be safe to take during these stages, but you'll want to get clearance to be safe.